First of all, let me wish you all a happy new year, full of delicious and happy moments! There are regional variations on the Three King's cake in France. Around Bordeaux for example, they make a brioche-type crown with candied fruit and pearl sugar (I hear they do a similar one in New Orleans, not a coincidence). In Franche-Comté (home of Comté cheese, which I like a lot), they make a flat galette with no filling. 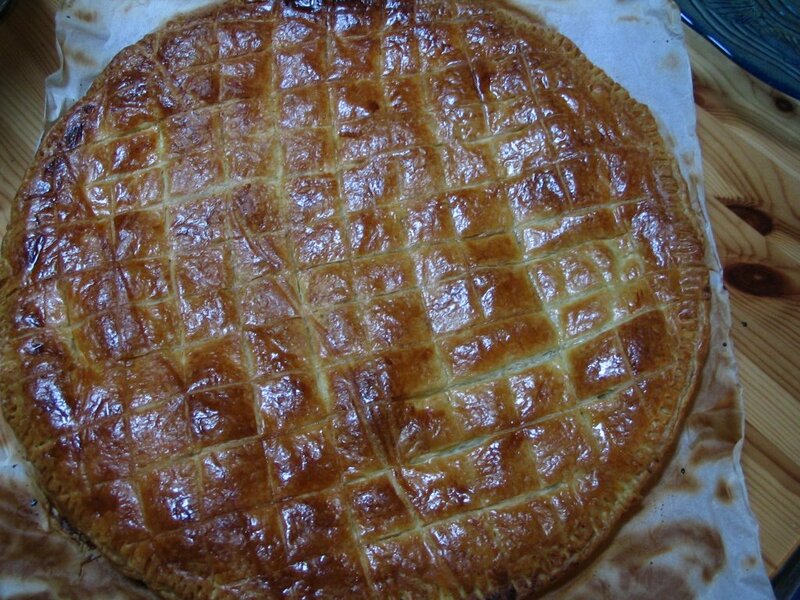 But generally speaking, the most widespread galette is a puff pastry affair filled with frangipane. Inside a fève (fava bean) lays buried, now a ceramic figure, and whoever finds it becomes king or queen, according to gender and/or sexual preference (ha ha). They're sold with golden paper crowns. When children are around, the youngest has to slip under the table while the slices are being served, the child can decide who gets the next slice from under the table, so that, if upon slicing, the fève is discovered, which happens 80% of the time, the same child is granted it, and has the surprise of becoming lord of the day. You just mix everything together, spread over your bottom pastry, insert your fève or a clean coin, then cover with another pastry disc. Seal the edges well -I use a fork for safety but some eggwash will do. Take a sharp knife and draw a pattern on top, brush with milk or egg and bake for about thirty minutes in a hot oven (200°C). When it comes out of the oven, you can brush it with a syrupy glaze (water and icing sugar) to give it a brilliant finish. If you're making a large one (about thirty cm in diameter), you might want to double the quantities. This filling is nevertheless not the traditionnal frangipane one, which is a tiny bit more work and creamier. I like it better as it is more almondy. I have also used hazelnut powder successfully. Your call. 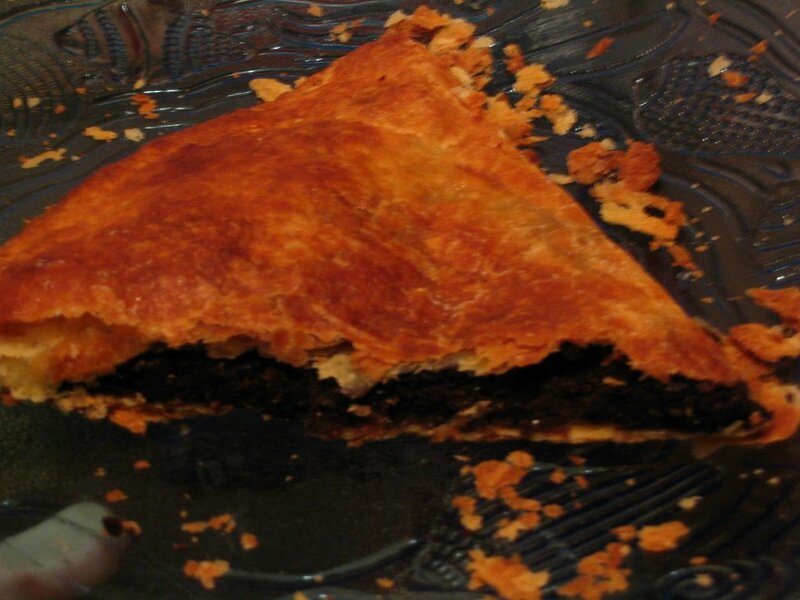 I have also made my own puff pastry which isn't difficult, just time-consuming, but not much of it hands-on, look here. As I type, I am in the process of making some too, for tomorrow's galette! There is only one word for that: Stunning! Happy New Year! Looks very yummy. I'm loving Germany! It's a bit cold, but we did get snow on Christmas, so I was ecstatic!! This sounds like a really cool tradition. I will have to incorporate it into our family's holidays. Julie, your confection has my mouth watering. It looks scrumptious! I love the traditions surrounding it too. It looks amazing, Julie. Thanks for sharing not only the recipe but the 3 king's cake traditions- those are the mmost important part of the holiday. It is too late this year, but I think I will incorporate this into my holiday next year!